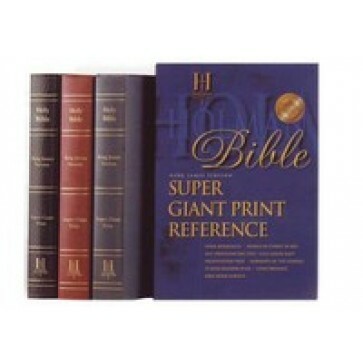 This King James Super Giant Print Reference Bible with a very readable 18 point type size continues to be our best selling Giant Print Bible and is ideal for puplit use or for the vision-impaired. It is a very special gift indeed for seniors who have cherished the Holy Bible throughout their lives. Please call for gold stamping. Features include Giant Print study helps and favorite Bible readings. Comes in black, burgundy and blue; indexed and non-indexed.